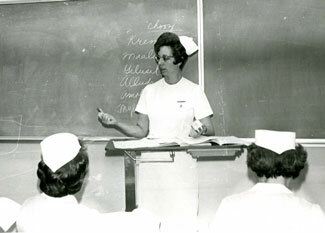 Doreen Lorenz - Foundress and Director of the Practical Nursing program. In early 1964, Administrator William Erickson and Director of Nursing at Auburn Hospital, Agnes Farr, contacted Ray Needham the director of the Green River Vocational Technical Institute and requested the development of a practical nursing program. Under the direction of Doreen Lorenz the curriculum for the program was developed and submitted. Margaret Simpson, executive director of Washington State Board of Practical Nurse Examiners granted approval for the program on July 17, 1964. Since July 1965, 1185 Practical Nursing students have graduated from Green River. The majority of these students passed the licensing exam on their first attempt. The program’s curriculum has had many changes in course content over the years including the inclusion of four nursing paradigm concepts that make up the program’s conceptual framework and eight curriculum concepts that are the basis for delivering care. In light of the dire need for nurses both locally and nationally, the college has had the foresight to support the nursing department and the community which it serves by creating new and improved facilities for the nursing program. Also, the administration has approved the development of an associate degree in nursing which will allow students to pursue a registered nursing license. This program is currently in development.